The more we learn about life on a Game of Thrones set, the more we can appreciate everything that went into creating that on-screen grittiness. Sophie Turner, Emilia Clarke and Liam Cunningham recently talked about their experiences on Game of Thrones, with Clarke discussing the complex emotions she feels to be leaving the show behind, Cunningham hyping the new season, and Turner dishing on the not-so-stellar hygiene she had to adopt. A maid with purple serpents in her hair, indeed! In a interview with ET Online, Turner admitted that around season 5 she was asked to stop washing hair to add to Sansa’s haggard appearance. Turner did clarify that some of her male costars were also asked to refrain from washing their hair, which must have been particularly difficult for Kit Harington, whom Turner says was the cast member who put the most love and effort into his locks. “Sansa’s hair changed season by season depending on who was influencing her,” Turner said. “The first few episodes she was a Northerner in Winterfell and took after her mother with a simple braid down the back. Then when she went to King’s Landing it was a big, decadent halo that was very much like what the Queen wore. With Littlefinger, she dyes her hair black and wears all black. Then she goes back to Winterfell and returns to her mother’s hair. Turner started wearing a wig in season 7, which freed her to regularly wash her hair again but also lengthened her prep time considerably. While promoting her upcoming dramatic romantic comedy, Last Christmas, with Daily Mail Emilia Clarke talked about the sense of loss she feels at leaving Daenerys Targaryen behind. “I cried like a baby on the last day. I felt completely lost,” Clarke said. “It was very strange and wonderful to get [Last Christmas]. This part couldn’t be more opposite, because dragons ain’t funny. Clarke promised that the epic conclusion of season 8 will be “a real whopper, especially for Daenerys.” Whether that bodes well or poorly for the second-to-last Targaryen remains to be seen. The Night’s Cast Episode 10: Discussing “Stormborn,” with special guest Oz of Thrones! ETA, I got the “Hodor”, haha. Now I’ll go and actually read the article. “[Kit] put the most love and effort into his locks”. haha, Sophie is just great fun at trolling the fandom. I can only go about three days without washing my hair before all I can think about is washing my hair. Please don’t make me feel like Charlie Brown with Lucy yanking away the football again. So, Dany’s dramatic fall from potential queen of the seven kingdoms to Burger King employee is happening afterall. I knew the leaks were real! Good to see Emilia talking Thrones again. She used to post pretty often on IG, but I haven’t seen anything in quite a while. I can only imagine how it would feel for Emilia and gang to have a moon-door sort of abyss to step out of after having a constant returning series to go back to. Liam is always so enthusiastic, I love his interviews. hahaha was thinking the same. Maybe she will be put between two buns. If that’s true I’m wondering if Daario will return and be one of them. I have to say, no matter how Dany’s arc end and how we will look at her (good or bad), Emilia is one of the most fun actors on the show. The way she talks about it, she really appreciate what the show did for her. she tends to prefer her burgers burnt to a crisp, so her stint at Burger King won’t end well and it’ll be her undoing. Good point — it might indicate Sophie’s been strung along with promises from the showrunners, just like we have. Apologies. We’re just waiting on the signature gravy to be ready. You cannot give up on the gravy. With all this talk of the final season being like 6 blockbuster movies, I wonder if HBO plans on raising their sub prices before April. Netflix just raised their prices again. I’m glad that they made the actors get grungy. It drives me bonkers whenever a movie shows a character waking up in the morning with perfect hair and full eye makeup. Even worse when it’s a deathbed scene for someone dying of a lingering, wasting disease and they still look beautiful and radiant. What exactly have the showrunners promised but haven’t delivered on? It’s one thing to take issue with what the cast and crew project onto a season, but D&D rarely speak in regards to the quality of anything. They just create and sit back. Please don’t bring that irrational showrunner rhetoric into these comments. And besides, if you know Sophie then you know her ramblings are at the result of her own eccentric and quirky personality. 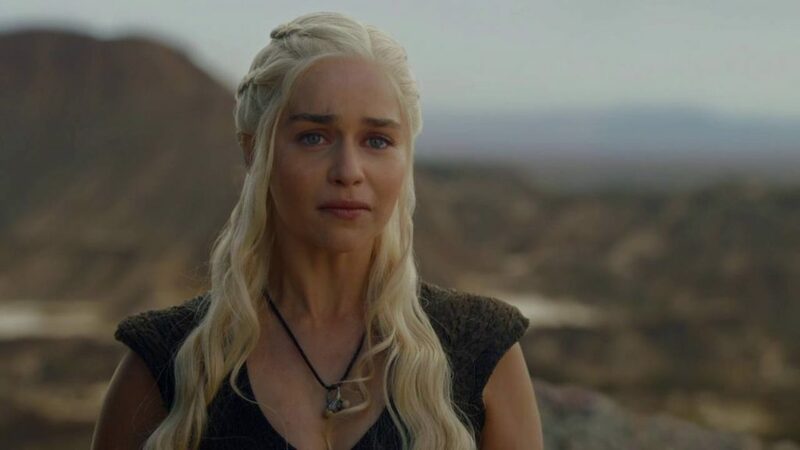 ”The way she talks about it, she really appreciate what the show did for her.” Emilia is a talented troll who likes trolling the fans about S8….What she have said for S8 and her character arc ending shouldnt be so believable ..we should taken with a lot of salt and grain .You [as i] should to do that ..if you are a smart boy..at all. Lets see..SHE IS TROLLING US . Where’s this Sansa photo from? I am jealous of Kit Harington’s hair, even the lopsided widow’s peak. Ugh, the wait is getting unbearable. I’ve been fine so far, I’ve endure the last 16 months without much issue, but now it’s getting tough. Let it be April already !! Agreed. I had prepared knowing Season 8 wouldn’t be in 2018, but now that it’s less then 3 months away I’m ready! I’ve started a complete rewatch of the series ready for season 8, midway through S1 and I’m still entranced by Maisie’s acting! Emelia never lied or trolled the fans before so why do now. If she troll the fans in such a way that everything she said was not true, she will get a hard time with her next projects and her fans. Lying to the fans can only be the way Kit did it at the end of season 5. He said Jon is really dead. And in the end that statement was 100% true, he was dead at the end of season 5. Same with Emilia, her words maybe be put into another content that we understand right now, but if she want to stay believable in the future with other projects, her words needs to be holding the truth. You can bend the truth as an actor not utterly lying to your fans. But there’s a lot more that will support that her words can be taken more seriously then we thought. She was done filming much sooner than the rest of the main cast. I’m wondering why. Exactly, Emilia was done filming much earlier than the rest of the actors. And she was in Belfast only 12 weeks while for example Sophie Turner was there for 16 weeks. Which means more screentime for Sansa than Daenarys this season. That explains why Daenarys isnt featured in promos, the Starks will be the main characters in season eight. I cannot wait! Let’s not spread misinformation, neither of those statements are correct. I don’t think so, Sophie Turner was done early as well but both came back after an absence. Emilia – likely because most of her stuff will be filmed inside with green screens..drogon and all. And Sansa because she’s not a ‘fighter’, she’ll likely be hunkered down somewhere inside with the women and children, etc. I wouldn’t read to much into it. 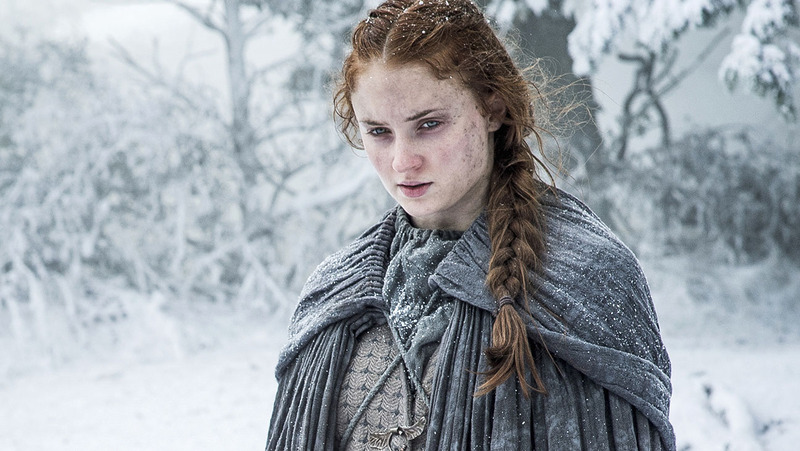 In that Sansa photo, she looks like a Wight. With just a few scratches and a gash or two she’d look like Karsi’s bff. Wait, what? Does that mean Jon Snow is destined to become Burger King in the North? Ah good. An Arya semi-derailment that I didn’t instigate. Seriously, I’ve been astounded at how good Maisie Williams has been ever since S1. Even in split second scenes in the very first episode, e.g., watching her mischievous face as she prepares dessert to spoon-fling at Sansa, and then her look of disappointment when Robb picks her up and tells her “Time for bed.” Such a natural. In fact, she was so good at conveying emotions that I still cannot bear to rewatch that scene from “Baelor” when the camera focuses on her face pressed to Yoren’s chest as her father is being executed. I agree. I was just about to say that Emilia has probably filmed more than half of her entire scenes in the studio/front of a green screen. So it’s much more easier for her to be elusive during filming season. Alright. You all got me started. Be forewarned. I’m covering this with spoiler-coding because it’s a bit off-color and political. Apologies in advance. (Orange Walder alone at his desk scarfing hamburger. Server: “But they’re already here my Lord. The thing about this statement that I find so interesting is the part that she says knowing that, and not knowing who. And what Daenerys is, and not who Daenerys is. 1. She will be turned into a white walker. 2. She is some sort of entity created by magic, and maybe not the real Daenerys. That’s why she can’t die and is fire resistant. 3. She is really dead and she kept alive with magic, same as Jon. Maybe magic die in season 8 and they will die. 4. Maybe she’s a dragon in human form. Remember Miri Maaz Dur’s words about how her child looked. Scaled like a dragon. 5. Don’t know, but I wondering why she refers her character as a what and not a who. Mods I see that my spoilertag doesn’t work because I forgot the beginning of the tag. Can a mod added that? Music is very important for me and especially when I have a feeling that I can connect with a certain tv-show or movie or in my own life. I was listening to one of the greatest singers of my country and looking at songs that I like. I found a song that remember me of GoT. It has some parts about trusting someone (or plural), that you must stop trusting, that could be refering to many characters, or even if something changes in season 8 about season 8. It is about fighting a common enemy with each other, and that you must not lose yourself in it. Your speculation about Emilia’s quotes are all fair. That is not true, she was actually amongst the last to finish. And Redwolf’s statement about her only being in Belfast for 12 weeks is incorrect as well. I should’ve made it clear those were the statements I was referring to, so my apologies for that. I do not know if Emilia’s comments are to be taken as an indication of her storyline. I do not think so. However, her comments do not sound that warm and positive on her character’s outcome. In his initial interviews, Kit also made a few comments that were also not warm and fuzzy. Sansa’s tone seems a bit more upbeat. I was also amused at how many times Jon/Kit said he was so “done” with GOT. Of course, he was tired and happy to do other things so it may have been just that. It seemed odd as he should still have quite a bit of promotional work left. And as the “expected main hero”, you expect him to do a bit of television work after the end of the series in sort “a victory tour” given the popularity of GOT; then he has the award season publicity work; then he may be expected to some small bits of promotional work to help the prequel get launched etc. Then the hero/king will be a bit like “Captian Kirk and Luc Picard” for the series. Saying you are so done was not in the spirit I expected. And Emilia’s comments were more negative sounding than Kit’s! Of course, it may seem like this way to me as I am not expecting these two to have a glorious reign over Westeros. But who knows? They may just be adding to the suspense. Of course, it may seem like this way to me as I am not expecting these two to have a glorious reign over Westeros.But who knows? They may just be adding to the suspense. They’re actors those statements are to be expected to come from them, I wouldn’t read much into it if I were you 😉 enjoy the season as it unfolds don’t overthink statements they release in the press. Also, yes just wanted to dispel that misinformation that Emilia was one of the first actors to wrap, she filmed her final scene before that Solo Star Wars promo started but she went back to film significant shots, mostly indoors until end of June. Her last IG post about Dany was on June 18 but that wasn’t her last day on set even EW reported on it, she and Jon and others were still shooting scenes after that post. They might be all WW at that point(i hope not) but the main actors were still shooting scenes(mostly indoors) till end of June and for Maisie early July. This season will be worth the wait, they’ve poured so much time into it, it has to be epic! LOL, well to be fair I think both Sophie and Emilia have performed their roles much better than some like to give them credit for. Theory # 6: She becomes a Burger King whopper. 🙂 That’s why Emilia says it will be “a lasting flavor in someone’s mouth of what Daenerys is…”. But seriously, theories 2 and 4 would be interesting. Hasn’t been any build-up or hints connected to them so far, though. All these theories are interesting! I never thought of her as a dragon, as Oleanna said. My view is number 4 is the most correct. Daenerys is not unburnt, she is really undead like Jon. Both will exit in some way when/if magic leaves. My only reservation with this idea is that it would mean the end of the Targs and I am not sure the story will do that. The “what” also comes up in the story, with Jon saying “what you really are” and Daario saying “what’s coming for [the Lords of Westeros].” Orell also says to Ygritte “what [Jon] really is,” so maybe its referring to someone’s true nature when everything else is stripped away. So Dany is a conqueror and that’s a plot turn that Emilia dislikes. But still wondering why she says what she really is and not what she become. That’s what I love about this story. It can go every way and it will probably make sense. Dany being the hero. Check could happen and make sense. Dany becoming the villain can happen and make sense. Dany being dead already make sense, being some entity can make sense. Maybe the big dragon that we saw in the vision of bran in season 4 is really her. 1. “Tweaking” Sansa’s books! story line and timeline, e.g., inserting her into the Jeyne Poole Bolton marriage plot and prematurely bringing her north, and then re-inserting her back to where she’ll (probably be) in TWOW, was not a seamless process. It often required her character to make decisions and take actions with sketchy or inexplicable motivations, like concealing the KotV from Jon; and agreeing to the ridiculous plan to marry Ramsay in the first place – with no clear objective and no means take “revenge” or to protect herself. I’ve said this before: It was kind of unfair to leave Sophie Turner twisting in the wind when she was asked about Sansa’s mindset in interviews – because Sansa’s motives were never explained on screen, and the showrunners ascribed reasons that did not comport with what we saw portrayed. In addition, the showrunners described her character progression in a certain way, e.g., as becoming a “savvy politician”, but they didn’t really have her character’s actions demonstrate that. I really thought the scene at the end of S4e8 (when she descended the staircase backlit in sunlight, with her Cat 2.0 hairdo and sleek new dress that made LF’s eyes pop out and then asked him coquettishly, “Shall we go?”) signaled the emergence of the new and improved Sansa. Here’s a clip of that scene (at 0:41 – end). We didn’t really see that confident. self-assured Sansa again until S7e7 – an episode in which I thought Sophie was stellar even if the trial by ambush of LF was a little wonky. So I think Sansa’s regression back to crash test dummy victimhood for another 2+ seasons after that wonderful scene in S4e8 – not to mention the squabbling with Jon and then with Arya – didn’t do Sophie Turner any favors. She deserved more of the Sansa we saw on the battlements with Arya at the end of S7e7. The real shame is that Emilia is such a bundle of joy in real life, and yet she has to play a role that rarely capitalizes on her natural charisma. Who doesn’t love her goofy videos and interviews? I had quite forgotten about the mushroom…….lol! Political satire, GoT style. Oh my! You’re in top form with this one. 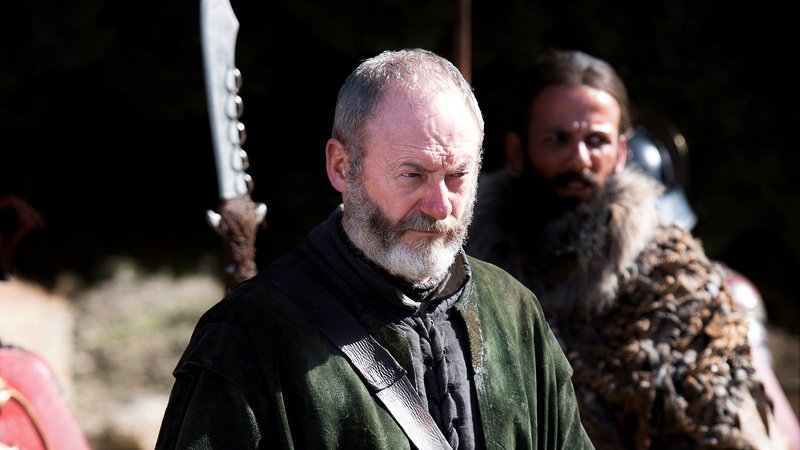 I’m calling it now Davos lives as hand of the king, Sansa ends up ruling the North (even though I find her one of the most boring/annoying characters on the show) and Dany dies.
. My guess is the death of Dany is reserved for one of the final two episodes. Jack Bauer 24: Agreed. I had prepared knowing Season 8 wouldn’t be in 2018, but now that it’s less then 3 months away I’m ready! I’m oddly the opposite right now, three months feels like it will pass quickly and without wishing my life away I’m actually enjoying the fact we know next to nothing about how the season will pan out so don’t crave the wait. A few weeks ago I was getting frustrated by the lack of trailer but the recent D&D interview has made me see things in a different light and now I actually hope we only get one trailer with ideally little info in it.